Samsung today expanded its smartphone line with the new I7110. 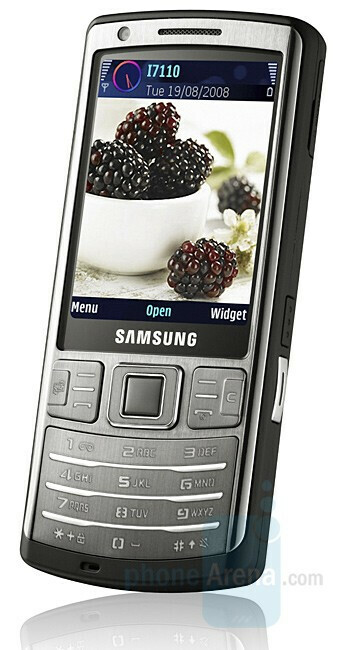 As the INNOV8, it is running on Symbian S60 3rd Edition, Feature Pack 2 but is a thin (12.9mm) candybar. Feature-wise, it is almost identical to the slider but lacks the huge internal memory and trades the 8MP camera for 5MP one, still sporting features like the smile and blink shot detection. It is equipped with a 2.6” AMOLED display that should deliver better image quality than a TFT. Features include 3G (on the European bands), Wi-Fi, GPS, DivX videos support (no XviD) and preloaded Asphalt and Fifa 2008 games. The I7110 will be available in Russia starting November and is said to be introduced to other markets soon. however, it says it has UMTS 900/1900. If this is not a typo, it could work on ATT. Yea, if VZW ordered it, it would lose the 5 megapixel camera, fm radio, symbian os (and replaced with the VZW OS), such and such. the iphones is soooo much bigger. will this be for att? hahaha jk i hate that too.